Though you can probably trust Nicole’s view (especially after seeing her pictures of the Split Pea Soup and Whole Grain Penne with San Marzano Tomatoes from The Conscious Cook), we thought you might like to try one of the recipes for yourself. 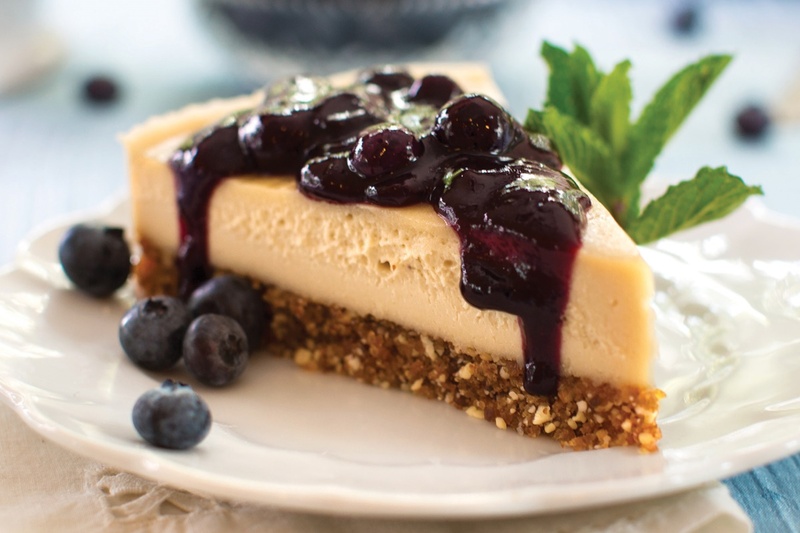 This particular recipe is from the dessert section of The Conscious Cook, and it goes well beyond your average vegan shortcakes. 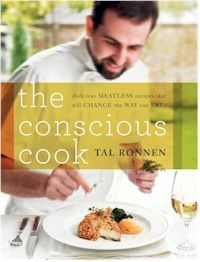 Recipe reprinted with publisher’s permissions from The Conscious Cook, by author Tal Ronnen. 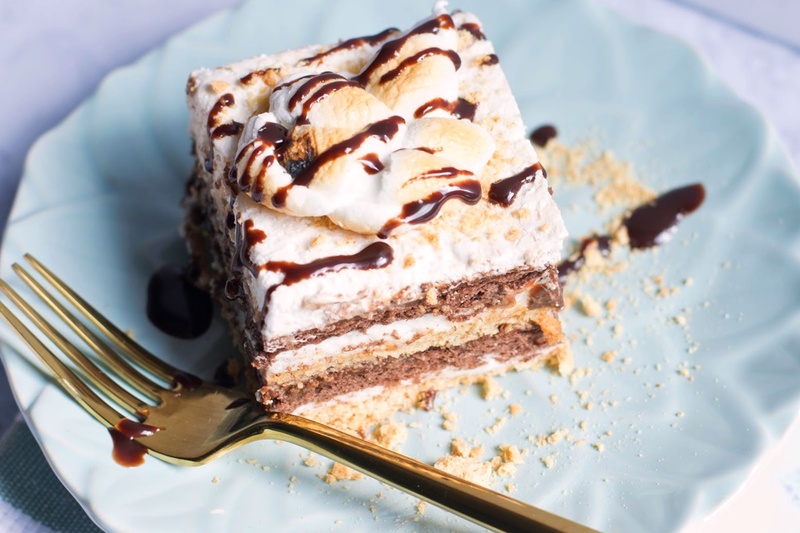 This is a pretty dessert with a vegan version of whipped cream that’s fantastic. If you can find Thai basil or cinnamon basil, use that in the sauce. They’re both incredible with blackberries. Remove from the heat and let steep for at least 20 minutes, up to overnight. Remove and discard the basil, then pour the sauce into a blender. Puree, then sweeten to taste with the agave nectar and add more lemon juice if needed. Push the sauce through a fine-mesh sieve back into the saucepan and gently fold in the remaining whole blackberries. 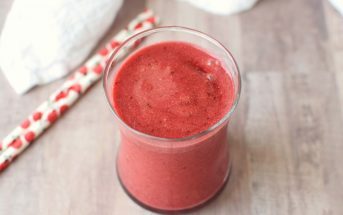 When ready to serve, heat over low heat just until the sauce is warm and the berries are thawed (if using frozen). Alternatively, chill the sauce in the refrigerator, covered, and serve cold. 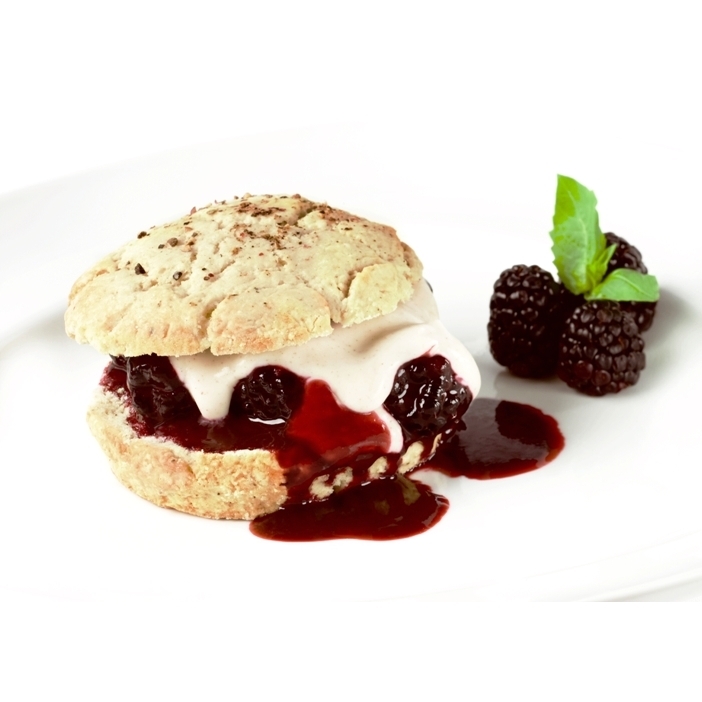 Make the black pepper shortcakes: Preheat the oven to 425°F. Line a baking sheet with parchment paper. 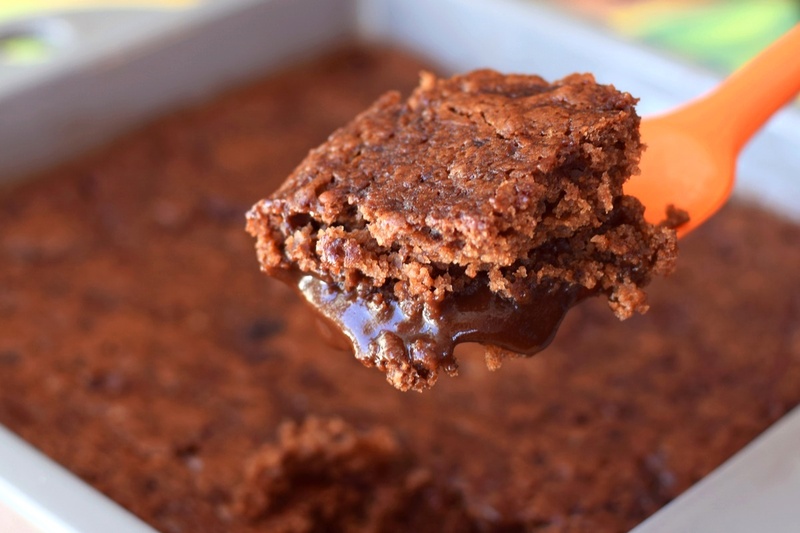 Sift the flour and baking powder into a large mixing bowl, then stir in the ½ cup sugar, the salt, and pepper. Scatter the Earth Balance into the flour and, using a pastry cutter, a fork, or—the best tool—your hands, cut the Earth Balance into the flour until the largest chunks are the size of large peas. 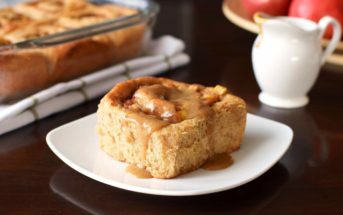 Make a well in the center of the mixture and add the creamer; using your hands or a wooden spoon, gently stir to make a soft, somewhat sticky dough, being careful not to overwork. Turn the dough out onto a floured work surface and pat it out to 1 inch thick. 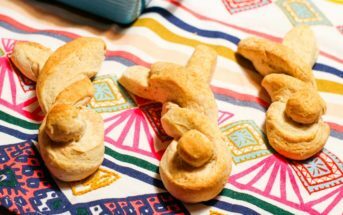 Using a biscuit cutter, cut the dough into 2½-inch rounds and place 1½ inches apart on the prepared baking sheet. Gently press the scraps together and cut out more rounds. Brush the tops of the rounds with creamer and sprinkle with the remaining 2 tablespoons sugar. Bake in the middle of the oven until golden brown, about 12 minutes, rotating the pan 180 degrees halfway through. Remove to a wire rack to cool. 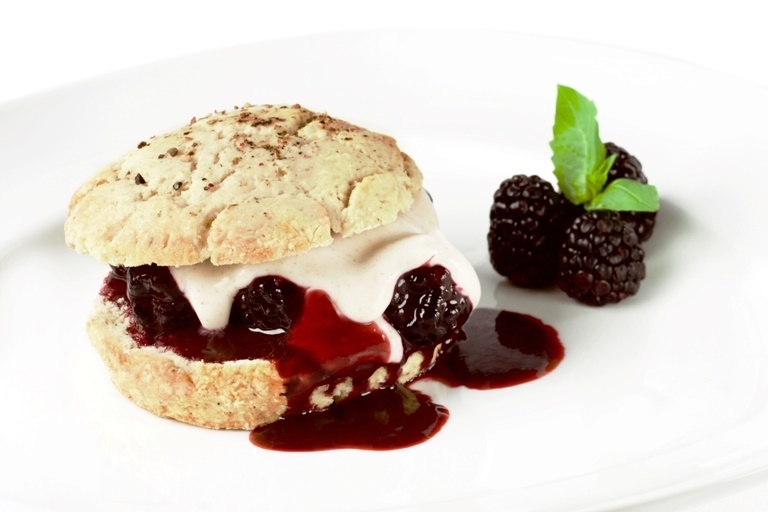 Serve the shortcakes with warm or chilled blackberry basil sauce and top with the Whipped Cashew Cream.